At last - National Rail taken seriously....? The traditionally labelled "British Rail" services in London have always been seen as a poor relation to the London Underground, both before and since privatisation. In many areas of South London it is the only choice, and in those areas stations are often run down and the services infrequent. Even in North London where many tube services exist, overground rail has had a part to play. Yet even here, networks have remained similarly underfunded with badly lit and maintained stations, with these and the trains attracting loiterers and miscreants of all kinds. Not only this, but for tourists these services are not only scary, but are confusing, with various information posters being displayed, using competing brandings - National Rail, Network Rail, Silverlink, &apos;one&apos; (whose bright idea was that?) etc. Even Londoners are often undecided as to what to call them. "I take the overground" is a phrase that many use, and the logical conclusion to draw is that "London Overground" would be a good, all-encompassing name. Transport for London took this on board and launched a petition to the Department for Transport (DfT) to allow rail franchise management to be passed to them for certain rail routes within London. They won the powers to do this for one franchise area - the former Silverlink Metro routes from Stratford to Richmond, Barking to Gospel Oak (collectively known as the North London Line) and Watford Junction to Euston (known as the West London Line). TfL awarded the "concession" as they call it, to a joint-venture company set up by Laing and MTR Rail which named itself, imaginatively, "London Overground Rail Operations Ltd" (LOROL). The East London Line, which is closed for extension works, will become part of London Overground when it is ready for operation. The idea was that &apos;metro&apos; services in South London, run predominantly by South Eastern and South Central (now Southern) would be marketed as if they were tube routes, eventually to have underground-style signage (see left) and TfL information posters on how to continue your journey. A map was also produced in the style of the Tube Map to show how these services link up. The exercise was considered a failure as it did not get whole-hearted take-up by the Train Operating Companies. In addition, 5 September 2006, TfL announced that Silverlink would become the first metro train operator to become part of a new unified "organisation" - London Overground. In reality, this would simply be a concessionary power to allow TfL to select, appoint and regulate the franchisee (instead of the DfT) for the Train Operating Company operating the North London, West London and East London lines (the latter thereby becoming part of the National Rail passenger network and ceasing to be considered an LUL &apos;line&apos;). * This stood for "Operated by National Express" - the service which is now simply branded "national express"! Left: An example of platform signage at &apos;on&apos;-branded stations, in "mock-TfL" style. And so it was that Silverlink&apos;s franchise came to an end on 10 November 2007. Their website played down this monumentally terminal event including many articles about the service as if it was going to be business as usual. Mind you, you can&apos;t blame them for wanting to spend much time and money keeping it up-to-date. In fact, it&apos;s amazing they even bothered to mention anything at all, in today&apos;s commercial climate. Usual, that is, in so far as the usual service standards Silverlink&apos;s customers had come to expect - regular strikes and all - and even though Silverlink were soon to be gone, Aslef couldn&apos;t resist buckling the spokes one more time, for old time&apos;s sake. 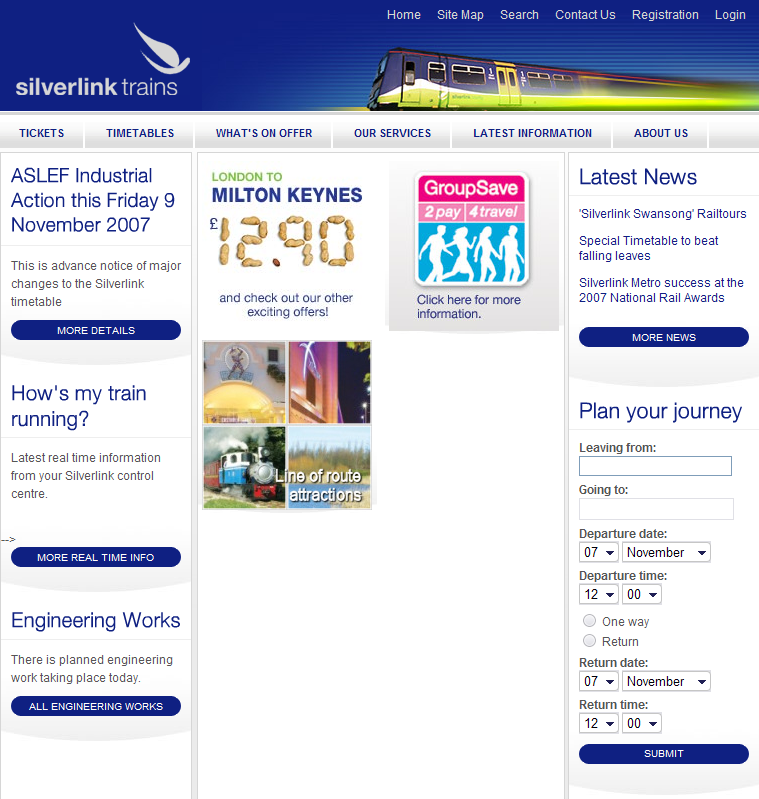 Left: Silverlink&apos;s home page as seen on 7 November 2007. Click to enlarge. Pictures hosted by flickr - see my photostream! Some of London Overground&apos;s promotional literature can be viewed below. Below: As you may have come to expect by now, I have toyed with the idea of alternative versions of line maps for London Overground aswell. The version below was done around the time the official ones came into use (Nov 2007) and was designed to be posted above the doors inside the carriage (rather than on the inside walls). I did recently tweak it a little, bringing the Clapham Junction branch to the left (it used to hang to the right). Click to enlarge.